A week ago, January 21, 2017, my wife and I were on a trip to New York and planned to visit my cousin and the new addition to his family in Randolph, NJ for the day. This is one of my cousins who had kindly housed us both heading to Maine and back from Maine during our Here, There, EVerywhere cross-country trip of 2015. We were staying in Manhattan the night before and had some time before we were scheduled to see them on January 21st, so it was a welcome surprise when we received an invite to the first Tesla Weekend Social of 2017. We wanted to see what has changed since the first social that we attended last year. We received the following email on the 14th of January. 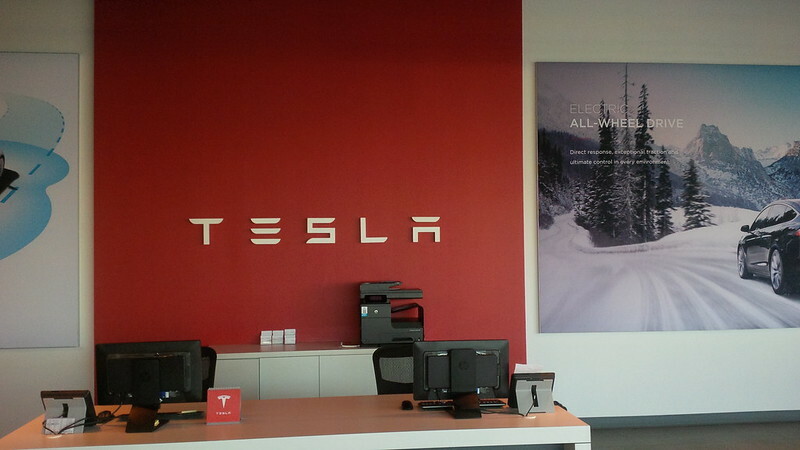 Please join us for a Weekend Social New Year celebration at your nearest Tesla location. Kick off 2017 alongside fellow owners, enthusiasts and Tesla staff. Family and friends are also welcome. Seasonal refreshments will be provided. 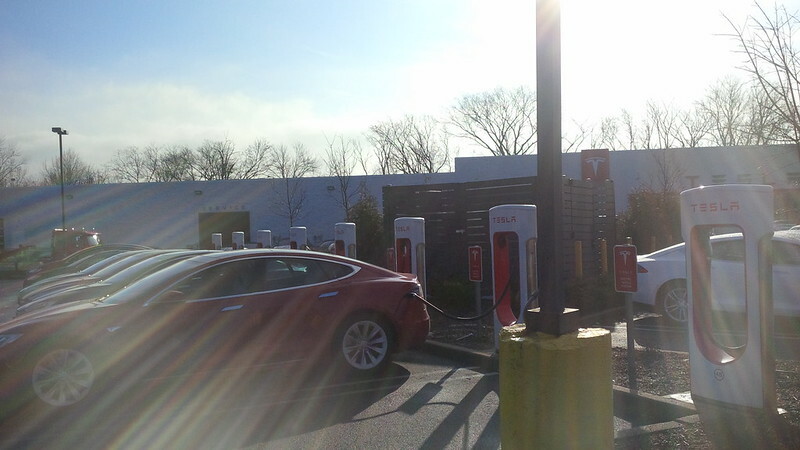 After some challenges obtaining a confirmation (apparently there were some back-end issues that was communicated to us and eventually fixed,) we were able to get a confirmation to be added to the attendee list at the Paramus, NJ Sales, Service, Delivery Center and Supercharger location. 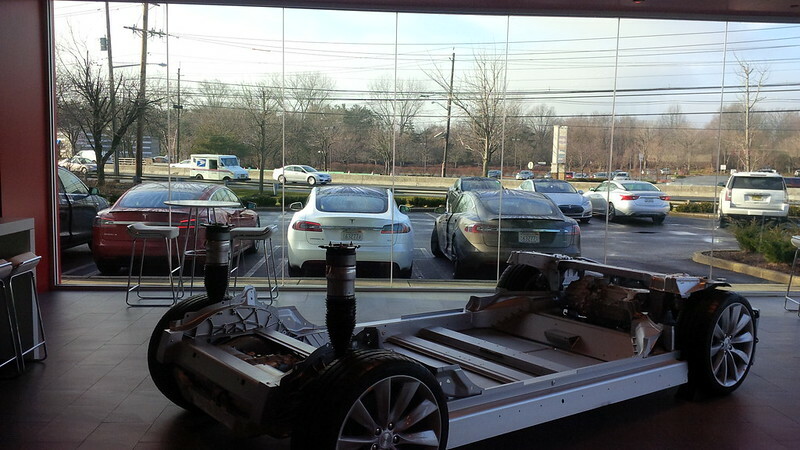 Since our family commitments were not until the afternoon, we decided to head over to Paramus, NJ to attend the first Tesla Social of the year and to spend a few hours with some New Jersey Tesla folks. To provide ourselves with the most flexibility for this visit, we rented a car from Hertz. Unfortunately, unlike our experience renting with Hertz’s On-Demand 24×7 product from a few years ago, there are no longer any electric vehicles in Hertz New York locations (nor is the 24×7 product being offered in the USA.) So, we had to rely on driving an ICE vehicle for this trip, a Ford Focus. We arrived at the location about 15 minutes before the scheduled 10:00 am program and secured a spot near the front of the store. Here is a photograph of the area by the entrance of the store that we parked our rental car in. We were originally parked right beside the HUGE ICE SUV on the right of the photograph. Upon exiting our rental, one of the employees requested my keys to move the vehicle to the back of the store. It’s a rental and I had some items in the car that I didn’t feel comfortable to be in a section that I can’t see the car in, so I asked if he needed to move it, that he move it somewhere closer. He decided to move it to the other side of the parking lot, away from the entrance and across the superchargers at the location. This location was not nearly as convenient as the customer parking spot that I originally used, but I figured there must be a reason why he needed to move my rental. However, as you can see from the first photograph, this was a strange request as our original parking spot was right beside a large ICE SUV and another ICE vehicle. We checked in and signed into the paper sign-in sheet that the store had placed at the entrance. Here is the walkway to the entrance and the sign in is to the left of the photo. 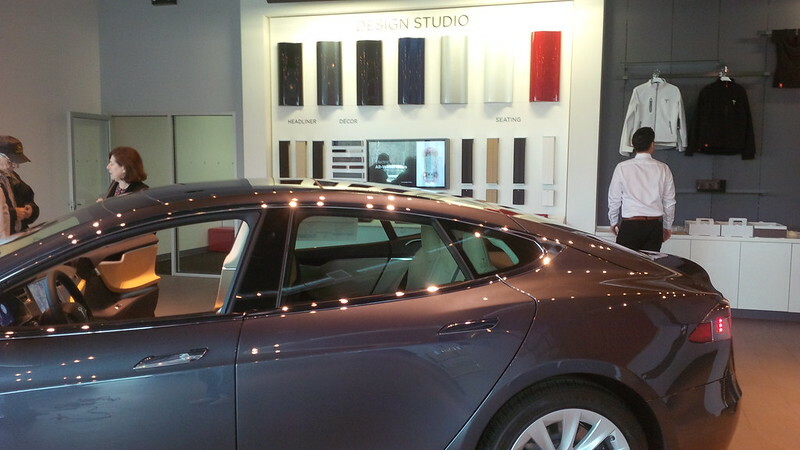 Directly ahead of the entrance is your typical Tesla Service Center entrance reception desk. (This is not normally situated in a Tesla Store). 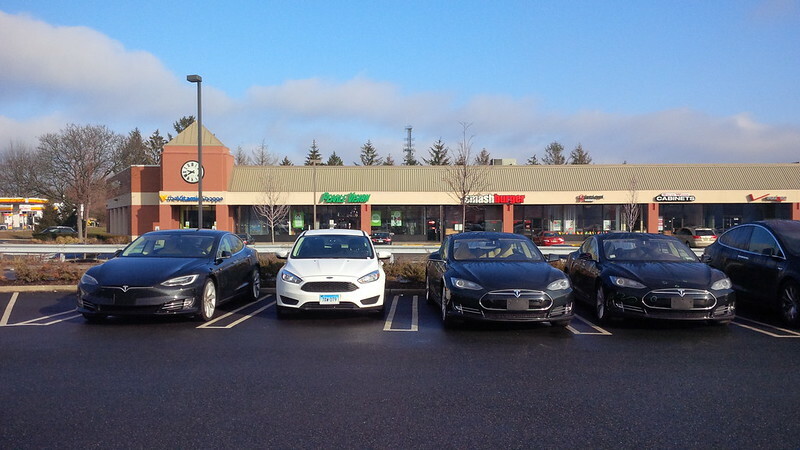 Remember, Paramus is a combination Sales, Service, Deliver Center and Supercharger location. 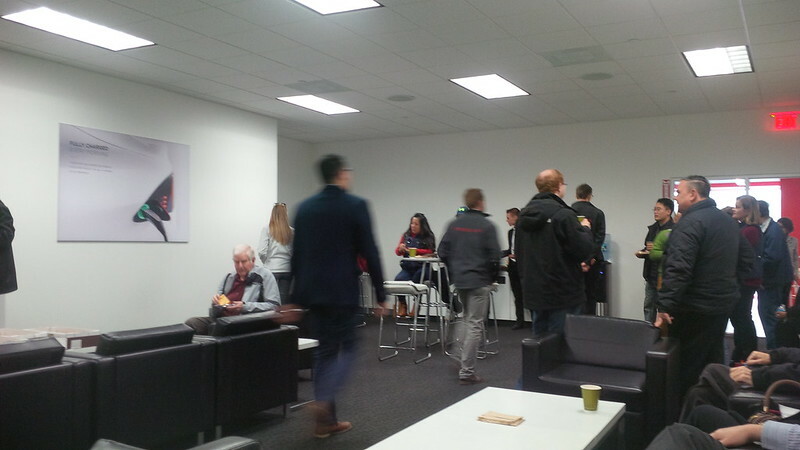 For the event, the store personnel provided coffee, bagels and other breakfast items along the credenza under the apparel, beside the Design Studio wall. I walked around the area to get my bearings and took a peek at the Delivery Center part of the store and saw an X and an S awaiting their new owners. It seems that the New Jersey folks were not one of the stores that cover the vehicles in some sort of drop-cloth as I’ve seen in other Delivery Centers. Not being used to weather, we originally walked in with our winter travel coats and realized that there was no place to keep our jackets. Rather than wear our jackets the whole time, I decided to return them to the car. I had to look for the employee who took our rental key to get access to the rental car and place our jackets in there. Once I located that employee, who is nameless, not to protect the guilty, but because he never took the time to introduce himself to me. 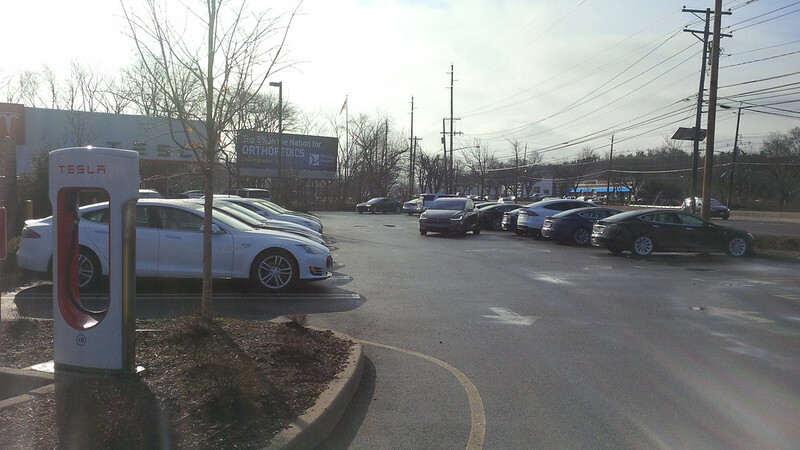 I found the car tucked in between several inventory Model S that they have on the lot, and not by any customer vehicles. The rental car was nicely surrounded by Teslas, but I did not ever notice any other customers vehicles being collected in the same manner as our rental car. It appears that we were particularly targeted for this as when I walked by my original parking spot. Another monstrous ICE SUV was parked there and not another Tesla or anything related to the event. I was a little miffed at this considering the fact that all other customers were able to park in the customer section and our little rental car was summarily moved. 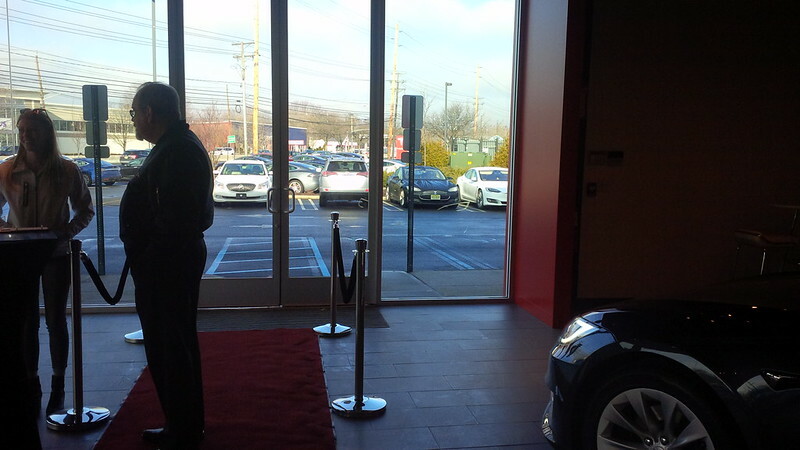 Either way, that’s a section of improvement for Tesla Paramus. Either valet park all cars, or leave them be. 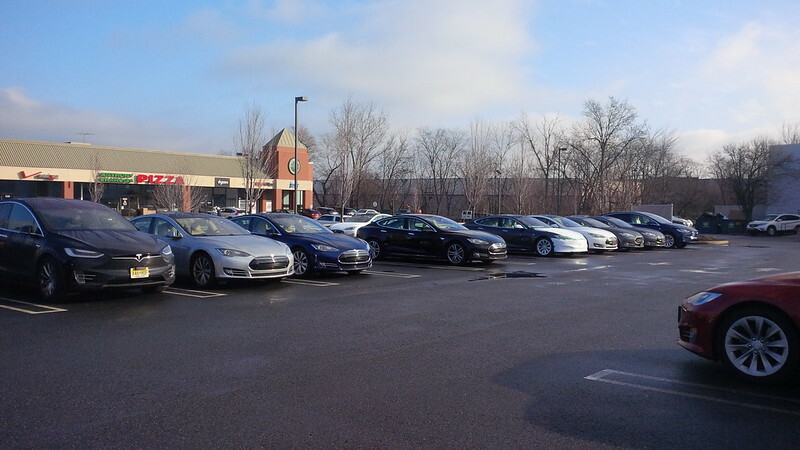 This particular event at Paramus seemed to be more casual than the other Tesla Social events that we have attended in the past. 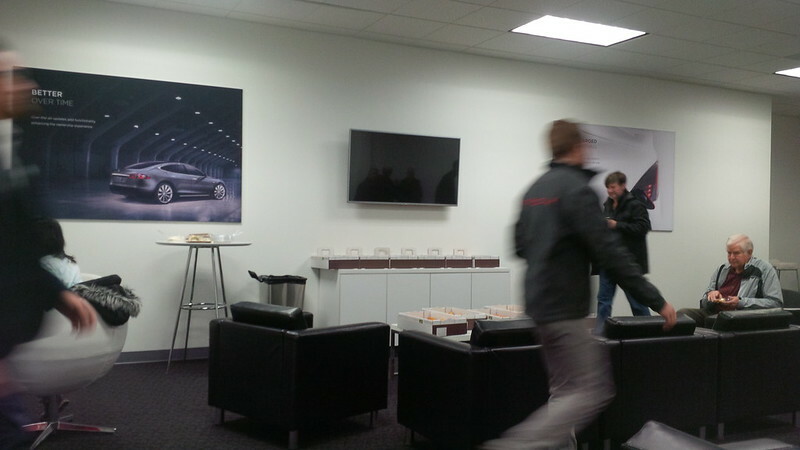 There did not seem to be an agenda and we spent a long time talking to the Tesla employees and fellow owners before we were brought into the lounge for the group discussion portion of the event. 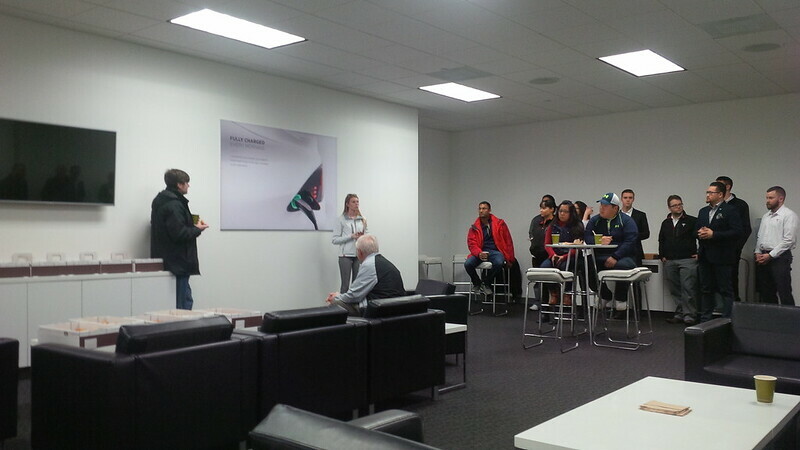 Prior to being brought into the lounge for the group discussion, we spent a lot of time with two members of the staff who were very attentive and we wanted to commend them. Monica and Joey (didn’t catch last names). Monica moved to Paramus, NJ from Pasadena, CA and Joey who just started a few weeks ago. They were very eager and helpful. Monica has been with Tesla for a while and we discussed her move to New Jersey from California as well as my wife’s Roadster and Joey, as a new employee, was effectively being trained by us as long-time owners of Tesla. Don’t get me wrong, I can spend HOURS talking Tesla with people, it’s just strange to invite a group of owners without seeming to have a plan for their time. We waited until about 10:45 am before the program started. However, program might be a generous word for this event. It seems that it was meant to be very free-flow and I suspect that an agenda and some structure could have helped make the event better. The format was very open and thus had a hard time maintaining a flow. There were many owners there. Topics ranged all over the place and it was interesting to hear information that was directly contradictory to advice that I have received in Southern California regarding tire rotations and the like from Tesla Service personnel in New Jersey. Perhaps the difference can be attributed to the difference in climate and weather between the states. In hearing from those involved at the location, it seems that folks around New Jersey have to go through a lot more tires than I do in Southern California. I didn’t want to be the cause of ire from other owners, so I politely kept this information to myself. Another subject that was brought up was regarding the $0.40 per minute supercharger idle fee that was recently enacted by Tesla. It seems that these concerns are quite universal and the discussion around this was interesting. After the group discussion wrapped up, a few of the New Jersey owners joined us in conversation as they were intrigued by visitors from California attending their session. 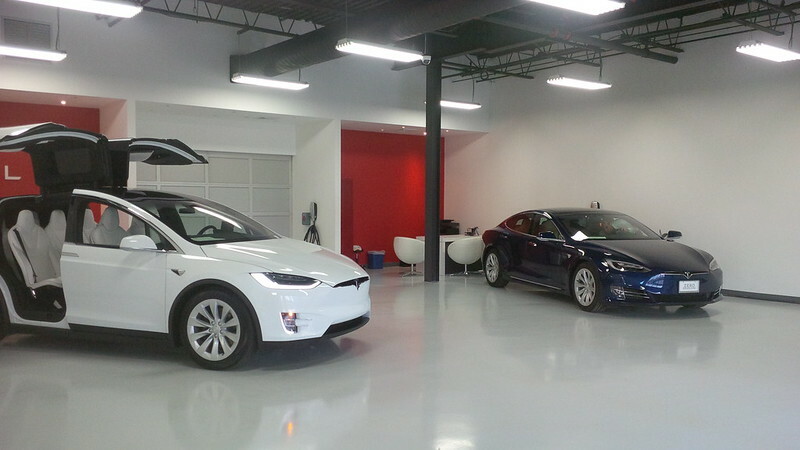 It seems that there is currently not an official Tesla Owners club for the New Jersey area and I spent some time explaining how the Orange County, CA club operates versus its other brethren in other parts of the world. Several of the New Jersey owners seemed interested in forming one for their area and I handed out club cards for them to reach out for more information. We also discussed Roadster ownership versus Model S as well as our visit to their state from our trip cross-country and how relatively easy and enjoyable that trip had been. In the end, it was just as advertised, it was a Tesla Social, but one without an agenda. I felt that an opportunity was missed in that this was the first social after some drastic changes in ownership for those that take delivery of a Tesla after the removal of the included supercharging for the life of the vehicle policy was replaced with the new pay as you go system. Additionally, it’s been a few days since the release of the Tesla Model S and Model X 100D top range versions of those vehicles and it would have been good to have been provided some sort of presentation on those. Alas, this was not the plan for the day. We spent some time with yet another early Model S owner discussing growing pains and we took our leave so that we can head out to visit my cousin and his family. We said our farewell to the two Tesla staff members, Monica and Joey, who provided such good company and service and left for the day. These two counterbalanced the unnamed employee who saw it fit to move our Ford Focus rental while leaving all other vehicles unmolested.